Speed too fast for conditions is most common single factor, involved in 58% of crashes and attributable to the large truck in 65% of those. I suspect that is underestimated because the data comes from police reports. While police try to do a good job, they typically do not have access to electronic control module data and are often not trained on trucking rules. If there is a fatal t-bone crash involving a tractor-trailer and a car entering from a side road, police may just blame the deceased driver of the car without digging deeply enough to know that the truck was exceeding the speed limit and could have stopped if it had been traveling at the speed limit. If a large truck is traveling the posted speed limit on a sheet of ice, even though their rules require “extreme caution” in adverse weather and when operating on ice to “reduce speed to a crawl and stop driving as soon as you can safely do so,” an officer ignorant of those rules may still blame the victims. I have seen both factors recently in my trucking litigation practice. Straying from lane of travel or driving on edge of the road. This factor is about equally attributable to large trucks and other vehicles. We see cases where this has happened. Without reliable eyewitnesses, it is often difficult to ascertain which vehicle veered out of its lane in the absence of clear physical evidence on the roadway. Driver errors, such as failure to keep a proper lookout or following too closely. 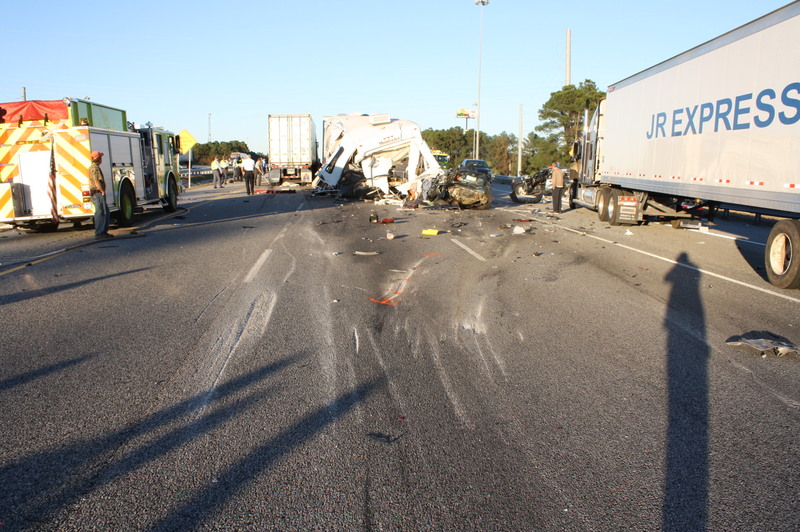 We often handle cases in which a tired or distracted truck driver failed to observe traffic slowed or stopped ahead and ran over passenger cars that were just sitting ducks in the road. We handled a case in Brunswick in which a trucker was talking on his cell phone with someone in South America and did not see the line of stopped traffic in which he killed three people and injured several others. 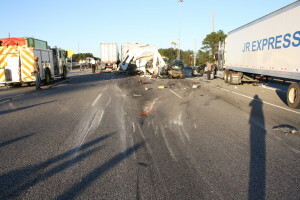 We have a case in Savannah in which a sleepy, inattentive truck driver failed to observe that traffic had stopped in a construction zone; he killed five people and seriously injured another. Of course, most of these factors can contribute to crashes of smaller vehicles. Most of us have experienced fatigue when driving on long trips, or have had lapses of attention while driving. But large trucks are different. Basic physics of mass and kinetic force is a big difference. Large commercial trucks weigh up to 80,000 pounds, and some of them are allowed to weigh more. Because of their greater size, it can take twice as much time and distance to stop as a passenger car even if brakes are working perfectly. They also operate for vastly more miles per year that passenger cars, so that maintenance needs are greater. Mechanical violations. A study in 2010 found that 56% of trucks involved in crashes had at least one mechanical violation, and 30% had a condition so serious it should have been taken out of service before the wreck. The most common of those mechanical violations involved brakes. Brakes. Various studies have reported that from 36% to 56% of large trucks inspected after crashes are found to have defective brakes, and that trucks with faulty brakes are more than twice as likely to be the vehicle that caused the crash. Steering. The same study revealed that 21% of trucks in crashes that were inspected had defects in steering equipment. Driver impairment. In addition to fatigue, illness, drugs and alcohol can be factors. Obstructive sleep apnea is an illness that underlies many fatigue-related crashes. This is just one of the long list of disqualifying medical conditions. Prescription and non-prescription drugs may result in drowsiness or misjudgment. Occasionally, alcohol intoxication is involved. A childhood friend of my daughter was killed when an intoxicated trucker rear-ended her family’s vehicle. In investigation of the causes of catastrophic truck crashes, we explore all these common causes and more. Ken Shigley is chair of the American Association for Justice (AAJ) Motor Vehicle Collision, Highway & Premises Liability Section which includes the Trucking Litigation Group of which he is a former board member. He is a member of the board of governors of the Academy of Truck Accident Attorneys, and a board certified civil trial attorney of the National Board of Trial Advocacy. In addition, he is lead author of Georgia Law of Torts: Trial Preparation and Practice, past president of the 45,000 member State Bar of Georgia, and past chair of the Institute for Continuing Legal Education in Georgia.